← Wubbo Ockels – in Space! From the Annals of American Political History: Harry Baals and Wankard Pooser. More of my silliness occasionally appears on The Millennium Conjectures. This entry was posted in Uncategorized and tagged american history, Americana, culture, Florida, funny names, history, Indiana, politics. Bookmark the permalink. 14 Responses to From the Annals of American Political History: Harry Baals and Wankard Pooser. I don’t think I ever saw Mark go all risque on us here at BoFN (I thought this was Arto!) but that said, I think this one was a masterpiece! I agree with Didds above, this is an instant classic. Gotta love those native city fathers, setting up a naming poll and then going back on it when they realize Harry Baals says *Harry Baals*. Gosh. 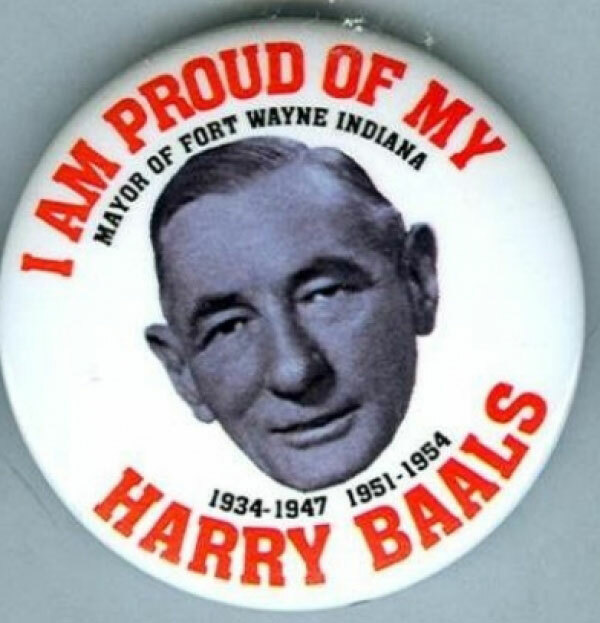 I hope the good citizens of Ft. Wayne continue to call it the Harry Baals center regardless. Mr. Wankard Pooser now has my favorite political name in the world, and is perhaps the finest political figure of the 20th century. We need a Wankard Pooser center somewhere. Somehow Wankard in combination with Pooser makes Pooser seem offensive as well, so I say more of both. What kind of world do we live in where you have to pronounce it Bales? That’s ridiculous. When we’re having fun, we’re having a ball, not a bale. A few miles from here, we have a Hairy Man Drive, a twisting, densely canopied road with an eerie early settler story to go with it. Surely the name will not be changed. I’d hate to drive on a shaved man. Harry was part of large family. The Baalz clan had a number of relations including famous cousin Brass and the oddly named Uncle Colder Than a Well Diggers but I dare not list them on a family blog. These names are so ridiculously good! It’s amazing the ridiculous names you can dredge up from American political history. I think we’ve barely scratched the surface, but somehow you’ve managed to find two of the best possible names I’ve ever seen. I wonder if the voters enjoyed these names as much as we do!